Who doesn’t love a new ship? Here’s the 2019 line-up that we’re all looking forward to! 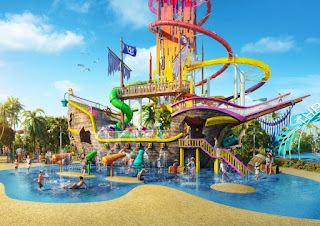 Spectrum of the Seas (4,246-passengers): In June 2019 Royal Caribbean’s Spectrum of the Seas, a ship custom built for the Chinese market, will start sailing from Shanghai. This is the first of the Quantum Ultra-Class which will debut a new private enclave for Golden and Silver Suite guests, including keycard access, a private elevator, dedicated restaurant and lounge, exclusive amenities and access to The Balcony for sunbathing. Unlocking Perks on Royal Caribbean With "The Key"
What onboard amenities would you be willing to pay for that would take your cruise vacation experience from good to great? How much additional are you willing to pay? Here’s Royal Caribbean’s thoughts on that very topic. Royal Caribbean Cruise Line is beginning to roll out a program called “The Key”, a collection of exclusive benefits which are available only to guests who purchase 'The Key (although many of these perks are available free of charge to guests staying in select suites). Today I wanted to finalize my travel plans for the upcoming year but with so many options I was feeling a bit overwhelmed! Did you know that when one of our Direct Line Cruises cruise consultants opens up our search engine tool to assist a prospective client in selecting a cruise vacation, the system shows 35,162 options available for booking! Wow! So how does one decide? For some it’s an easy decision but for others…. 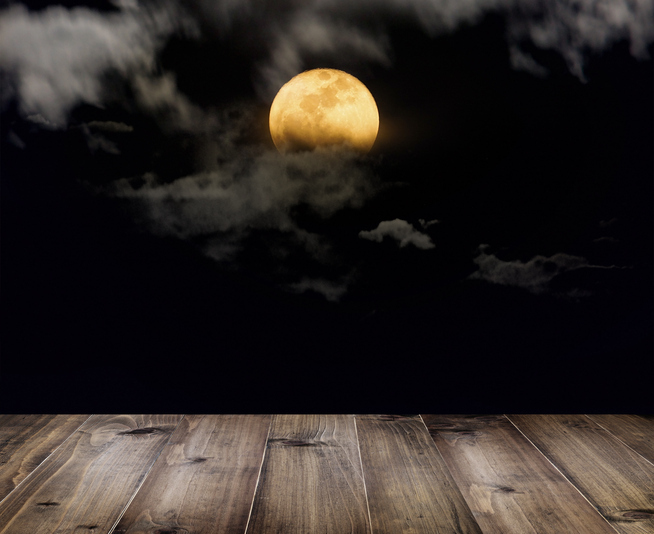 An answer to one of the following two questions will dramatically filter those seemingly infinite choices. Where do you want to leave from? If you’re determined to embark from a port that’s driving distance from your home, that narrows things significantly. Where do you want to go? 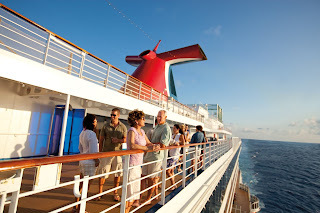 Again, picking a destination will assist in determining cruise line, cruise ship and the time of year you will travel. 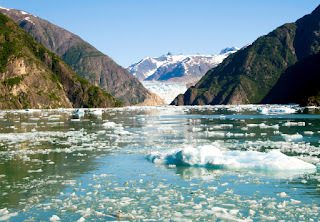 For example, if you want to journey to Alaska the cruising season is only May through September. 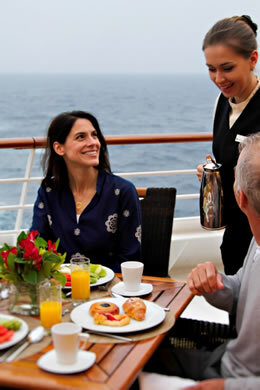 I recently returned from a Mediterranean cruise aboard the Azamara Pursuit and it was absolutely wonderful! I loved everything about it…the ship, the crew, the food and the ports of call. Still, certain “magical moments” stand out in my memory when I think back on the week and I wanted to share them so you can have a glimpse of what delightful events can happen on an Azamara cruise. 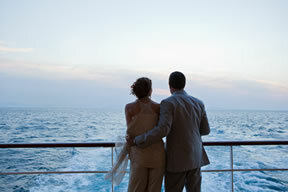 The Azamazing Evening is a signature Azamara event offered on most sailings. Imagine being invited to a very special event that only a select group of people are privy to. These events are unique, bespoke and is always an immersive experience into the area you are visiting. On my Azamazing area we went to a concert at Mediterranean Conference Centre in Valletta, Malta. Now this isn’t just any conference center. The building was built as a hospital in the 16th century by the Order of St. John, and it was known as the Holy Infirmary. Historic and lovely. We started the evening with a cocktail hour accompanied by traditional Maltese folk dancers. 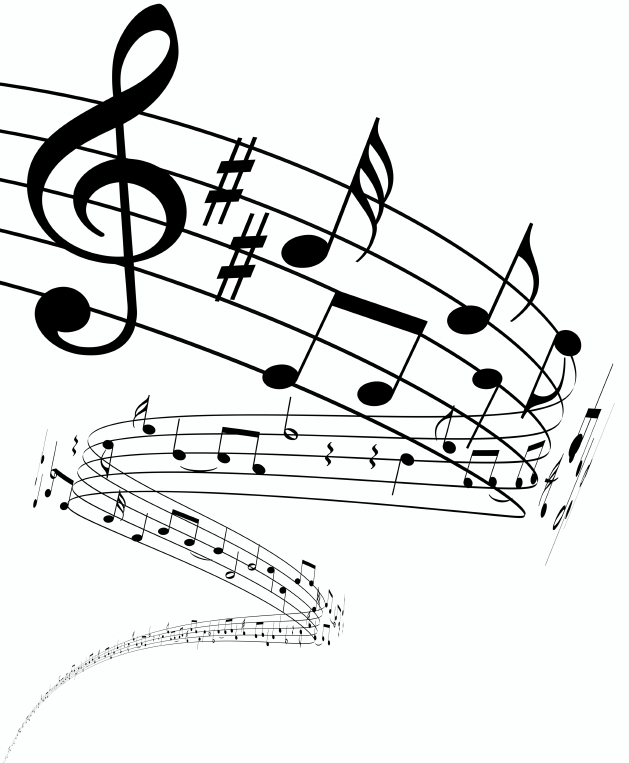 It was followed by a concert featuring an avant-garde band. This evening was a high-point of our cruise. Small ship cruising is new to me. I always felt the larger the ship, the more bells and whistles, the better the cruise experience. But more recently I started feeling that all those innovative, revolutionary additions no longer enhance my cruise experience…they just don’t matter much to me. 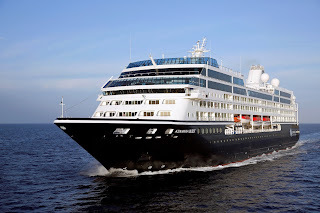 Last week I cruised on the Azamara Pursuit, a ship not much larger than 30,000 tons which carries a max of 777 guests. It was wonderful and I’m now a small ship enthusiast and an Azamara Club Cruises aficionada! The larger cruise ships I’ve sailed featured rock climbing, skating, sports court, casino and a plethora of other entertainment options. And that was all a lot of fun when I was cruising with my family. Now I cruise with just my husband or girlfriends and I find having all those activities distract me from the culture of the destination. The Azamara Pursuit had wonderful destination lectures that focused on history and culture instead of shopping. 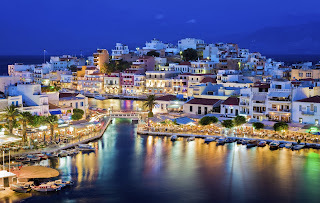 We stayed in port late or overnight which allowed us to experience the area with less tourists running around and we had time to dine ashore to experience local foods and wine. Shore excursions on the Pursuit go beyond traditional tours and immerse you deeper into the destination. There are cooking lessons, family visits, winery tours and arts & crafts classes… experience that just isn't offered on the larger vessels. 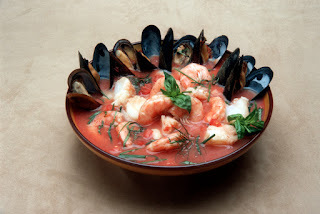 As a child and well into my adult life I was a picky eater…a VERY picky eater! I wouldn’t let a green vegetable touch my plate, only ate pasta with butter, and hotdogs were my protein of choice. Fast forward fifty plus years and I feel my taste buds have gone through an awakening…which has truly enhanced my travel experience in recent years! Now what can be better than combining my love of travel with my newly discovered love for food? Food and travel are made to go together! When you make a point of trying local foods while you're traveling I believe those tastes and smells become intrinsically entwined in your memories of the trip. 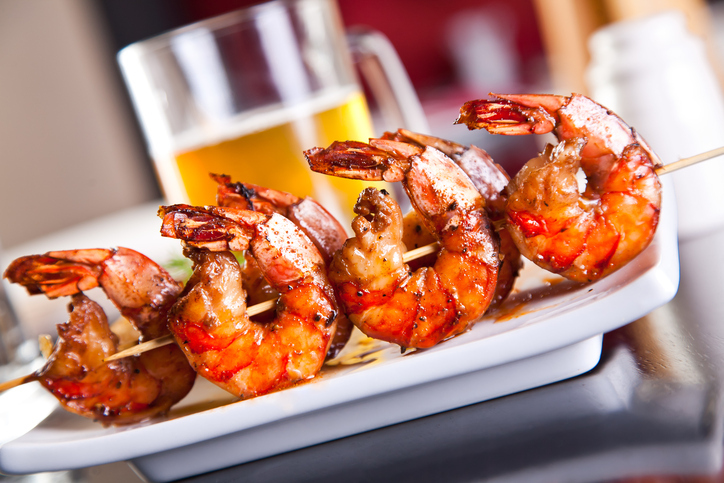 Have you ever noticed how even the faint aroma of something you ate on a vacation instantly takes you back to the moment you experienced it? There is no better souvenir to return home with! 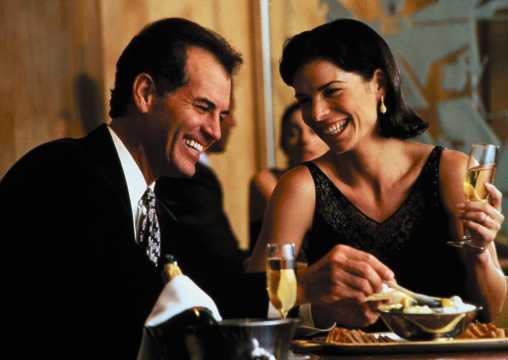 Due to popular demand Holland announced that they are adding 20 new immersive culinary-themed FOOD & WINE EXC Tours (shore excursions). Developed in partnership with FOOD & WINE magazine, Holland America debuted 23 excursions earlier this year on select cruises in the Mediterranean and Northern Europe that explore food, wine and culture in some of the world's hottest gastronomic locales. 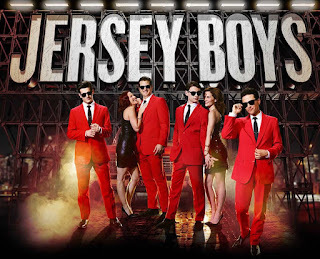 The new tours will be added throughout Asia, Australia, New Zealand and Canada & New England. Norwegian Cruise Line’s "Meet the Winemaker" cruise is a special program on select sail dates in which guests may participate in a variety of events with experts in the wine-making industry. This fun and educational series has proved to be a favorite of oenophiles and social drinkers alike. On these cruises guests will have several opportunities to engage with winemakers and other industry experts through a variety of enriching seminars and activities, including open-forum question-and-answer sessions and meet-and-greets. 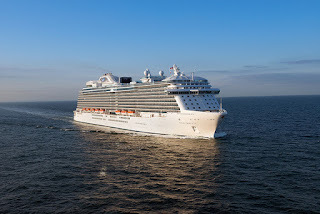 This is especially exciting news for cruisers that love to sail out of Cape Liberty, New Jersey; particularly those of you that have made the 7-night Bermuda cruise aboard the Celebrity Summit your summer tradition. That’s because in early 2019 the Summit will be taken to dry dock and when she emerges she will be a totally re-imagined ship! For years I traveled to Europe in the heat of the summer. 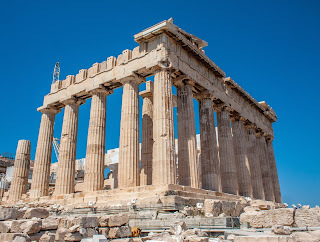 I was always insistent that our cruise vacations coincide with the school vacation calendar, and if that meant hiking up to the Acropolis in July’s sweltering sunshine, so be it! Fast forward to the present, and I can cruise any time of year. So, let me just say that cruising around Europe in the fall is a delight…for many reasons! My first reason is obviously the lovely weather! Ninety degrees or 75 degrees? That’s not a tough choice, especially when you’re spending your day running around trying to see everything you can in foreign cities. I am told Africa is one of the most beautiful continents in the world. One day I will see for myself. 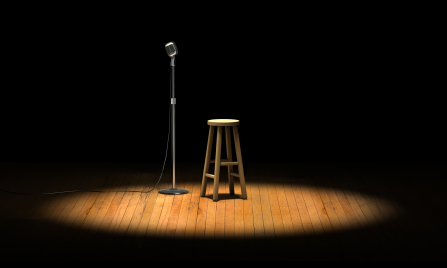 It’s on my bucket list (a VERY LONG bucket list) but the how, when or where details are still a bit vague. 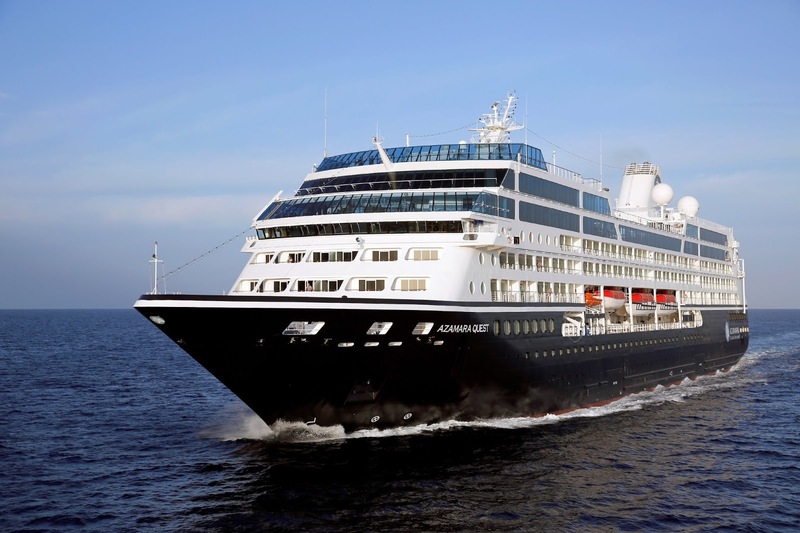 Then I read about Azamara’s South African Land and Sea Packages and thought it was such a wonderful itinerary, I wanted to share it in case Africa is on your bucket list too! Our “Hate to Fly” tagline, obvious in all print advertisement from Direct Line Cruises, is based on the fact that if you do hate to fly, you are never more than a couple of hours drive from a cruise terminal. However, it’s never a bad idea to arrive the day before, just in case (weather, traffic delays etc). 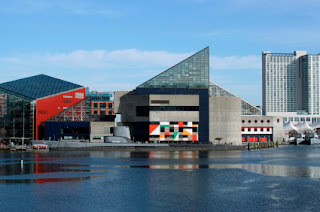 If you’re cruising on the Carnival Pride or Royal Caribbean’s Grandeur of the Seas and Baltimore is where you’ll be embarking, I’ve put together some suggestions on how to spend the day before you board! Although Halloween is months away, Disney Cruise Line is already planning for it’s not so scary Halloween celebrations onboard its ships this coming fall. The festivities include lively entertainment and elaborate décor, including The Pumpkin Tree, which magically transforms throughout the cruise. · Mickey’s Mouse-querade Party, a celebration with games, dancing and candy! Beloved Disney characters, wearing special Halloween costumes just for the occasion will join guests for a costume party. 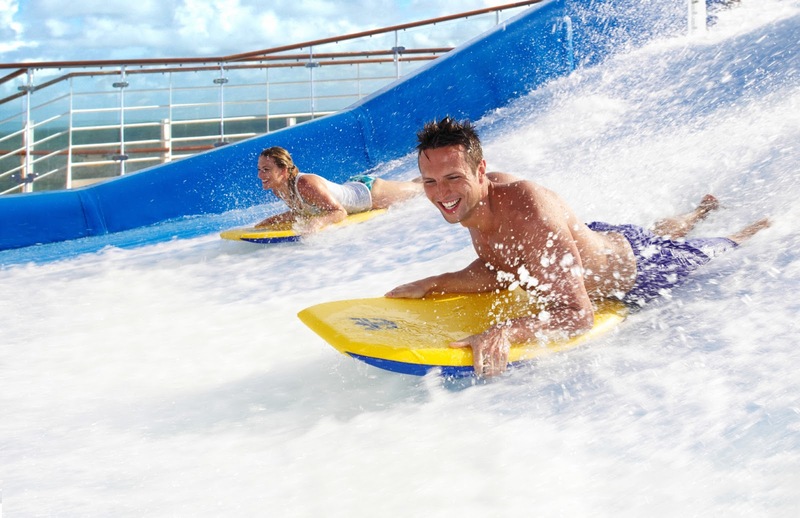 Royal Caribbean is amping up your favorite ship! Called Royal Amplified, these renovations are total transformations! It took 30-days and a budget of $110 million, but Independence of the Seas, the first ship to undergo the modernization, is ready to strut her stuff! I hope my explanation last week of a cruise ship’s spa area called the thermal suite was informative. As people begin to realize how the natural elements of the world we inhabit create such a strong foundation of healing and relaxation, the thermal suites aboard cruise ships become a real draw for passengers looking for holistic experiences that revitalize body, mind and spirit. Below are two of the best thermal suites at sea. What is a Thermal Suite? One of the most relaxing areas onboard a cruise ship is the thermal suite, yet many people are unaware of its existence or for that matter, what it is. A thermal suite is a series of rooms in the spa designed to expose the body to hot and cold temperatures, both wet and dry. 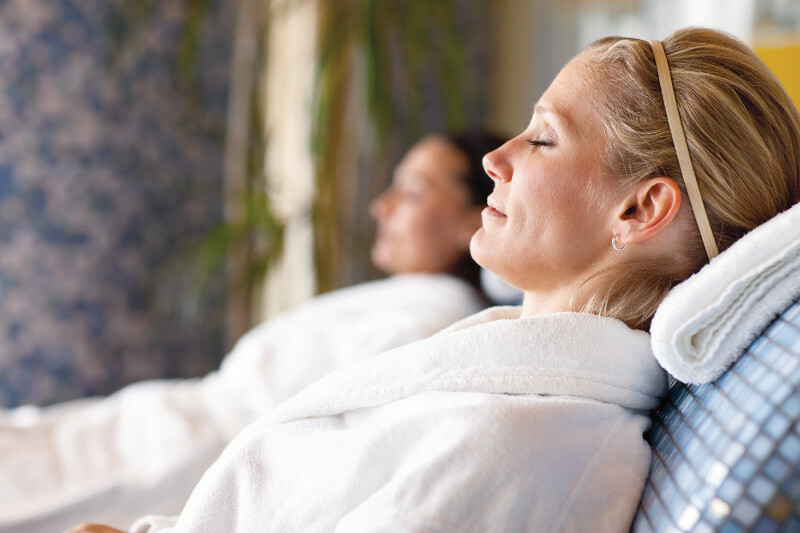 Aside from pure relaxation, the various rooms are designed to sooth, stimulate circulation, and detoxify the body as well as invigorate the senses. 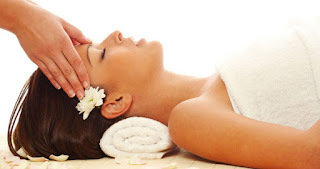 A thermal spa may consist of saunas, steam rooms, ice fountains, tropical and cold showers, snow rooms, salt caves etc. And after trying out the various options there’s nothing quite like a nap on one of the heated ceramic loungers. 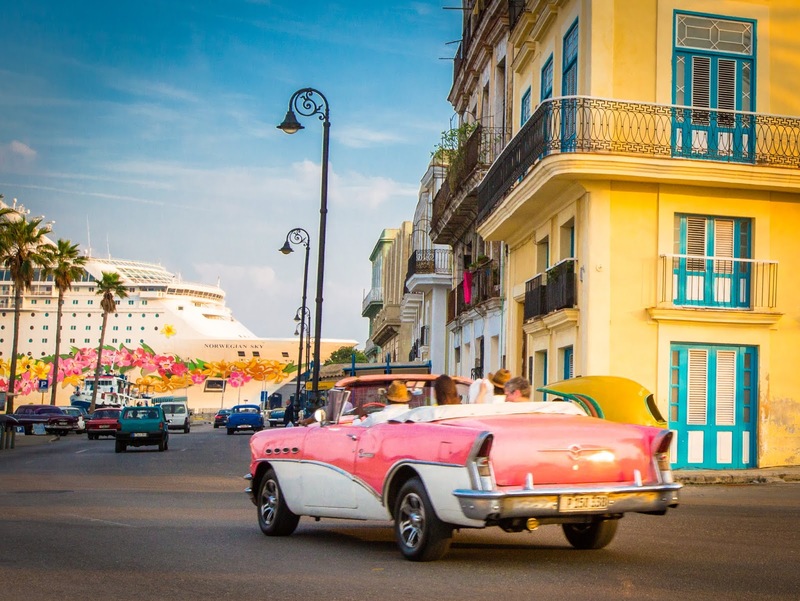 If you’re ready to experience the rich history and vibrant culture of Cuba, chances are your favorite cruise line has a perfect itinerary for you. 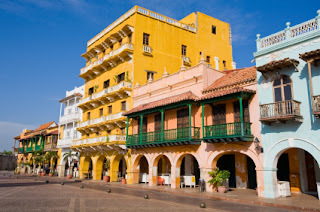 Whereas a year ago Cuba as a port-of-call was limited to short itineraries on select cruise lines, we are beginning to see several cruise lines expanding Cuba offerings. Carnival Cruise Line has recently announced 23 new Cuba sailings for 2019. 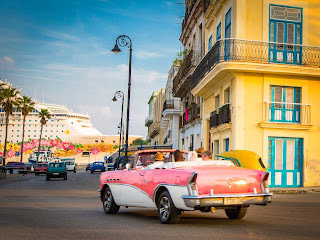 While many leave from the Florida ports of Miami, Tampa, Fort Lauderdale, Carnival will also operate eight five-day trips to Cuba from Charleston, South Carolina! 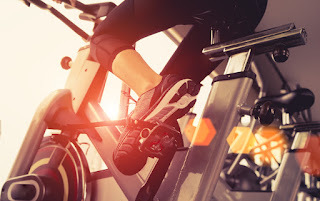 I never thought I would say that the availability of a well-equipped fitness center has become a top criterion in selecting where I stay on vacation. Throw in some classes and I’m in vacation heaven! Now with Celebrity Cruises and Canyon Ranch teaming up to revamp the current onboard fitness programs I think it’s time for me to book my next Celebrity cruise! I’m never shocked when I hear the statistic that the average U.S. employee only takes half of his or her eligible vacation time. Although I have all my vacation days planned out a year in advance (after all, planning is half the fun), I really must coax my husband into requesting all his due days! Crazy, right? 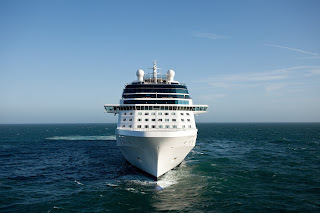 Well with summer right around the corner now is the time to plan a cruise vacation and I’ll share with you some reasons why it's actually good for your health! 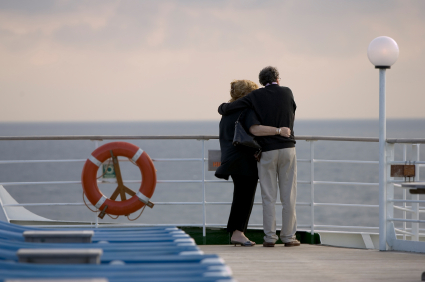 Taking cruise vacation is good for your health! Lots of studies have highlighted the potential cardiovascular-health benefits of taking a vacation, including reducing the risk of heart disease. The Framingham Heart Study (a long-term, multi-generational study, designed to identify genetic and environmental factors influencing the development of cardiovascular and other disease) showed that women who take at least two vacations a year are eight times less likely to have coronary heart disease. A study done with men who had an elevated risk for coronary disease, showed that those who didn’t take an annual vacation were 32% more likely to die from a heart attack than the vacationers. 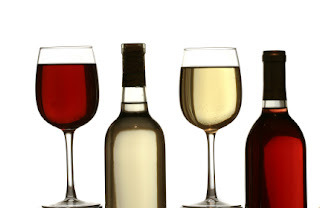 Vinotherapy On Your Next MSC Cruise? combine the two… and call it Vinotherapy? Well, the idea is not new and MSC Cruises has just launched a signature collection of spa treatments created with vinotherapy products from Bocelli Wines! River or ocean cruise? It’s a tough question to answer because I can easily make quite a case for either! To have the best of both is as simple as combining both into one fabulous, seamless itinerary. So that is exactly what Viking has done. 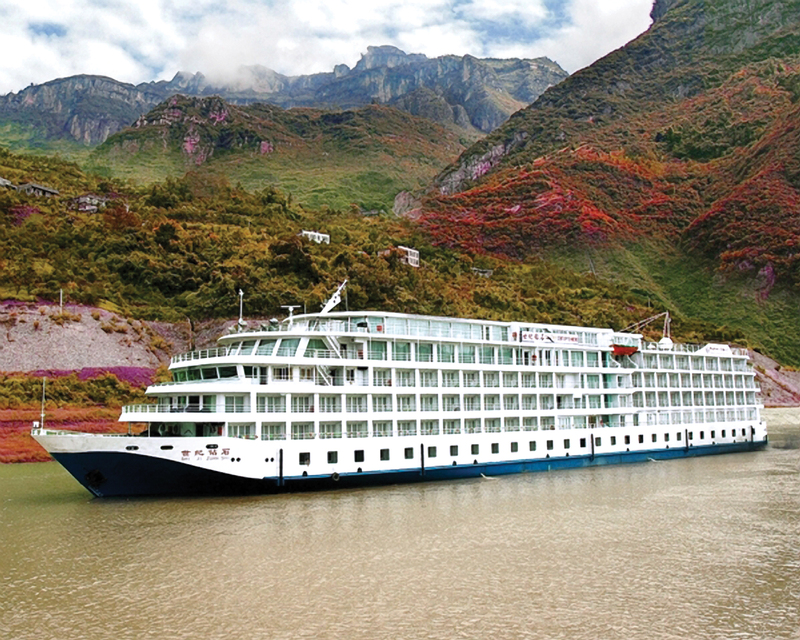 Beginning this summer Viking is combining river and ocean cruises in a single journey. Country singer-songwriter and recording artist, Camille Rae will be performing on the Norwegian Bliss which is set to debut this spring. 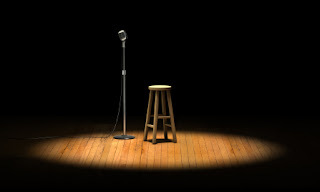 Accompanied by her four-piece band, Rae will perform country music’s hottest hits as well as signature classics from April 21–June 30 in Q Texas Smokehouse the ship’s new dining venue featuring authentic Texas barbecue. Have you ever caught an episode of the Animal Planet television series, Treehouse Masters? It’s been on for quite a few years and it’s a pretty cool show! It follows designer / builder Pete Nelson and his crew, as they travel around the country building tree houses! Amazing, incredible tree houses that are built for kids, for family homes, and even as retreats. 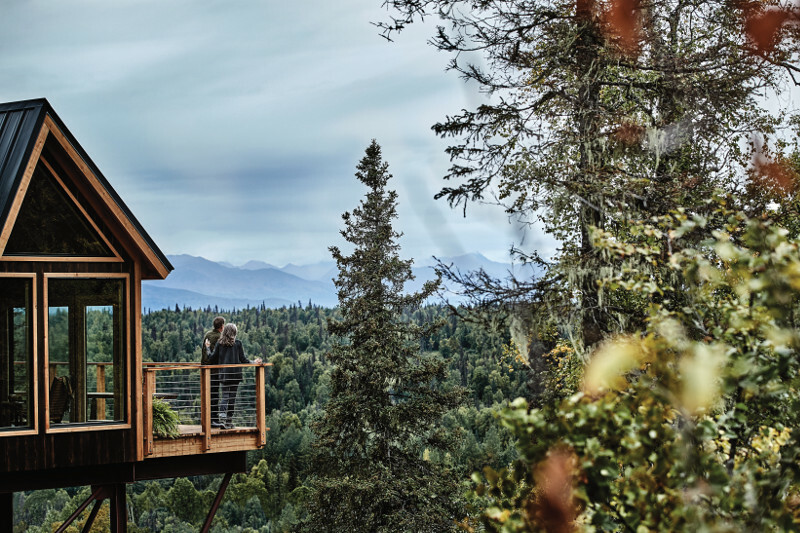 And more recently, Princess Cruises, in association with the line’s partnership with Discovery Communications, had the crew create a custom designed wilderness treehouse located at Alaska's Mt. McKinley Princess Wilderness Lodge! Some cruisers would never consider walking off their ship with or without a guidebook in hand, to independently explore a foreign city! Many like the comfort level a shore excursion, whether it be ship sponsored or not. 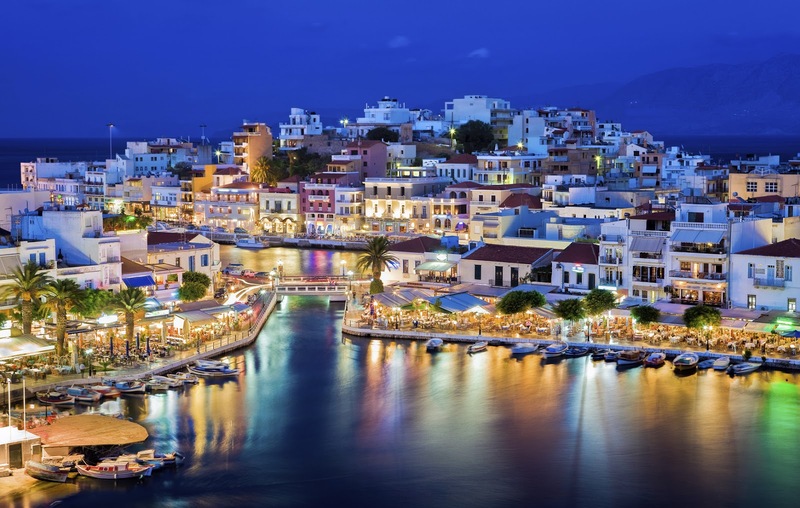 Others would disagree, saying there is so much more enjoyment heading out to discover a port by wandering the streets, chatting with the residents, and sitting down to enjoy the local cuisine. Personally, my familiarity with the port city will often hedge my decision one way or the other. 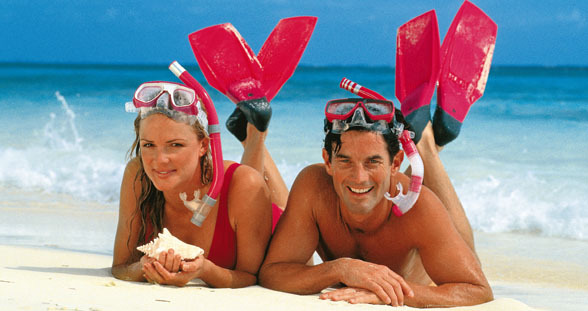 But if I choose a shore excursion, it must be one that offers an authentic experience I could not achieve on my own. That is why I find Celebrity Cruises’ Discovery Collection so appealing. This coming summer Royal Caribbean’s Mariner of the Seas is repositioning to Miami to add some freshness and excitement to the standard three- and four-night Bahamas itinerary! 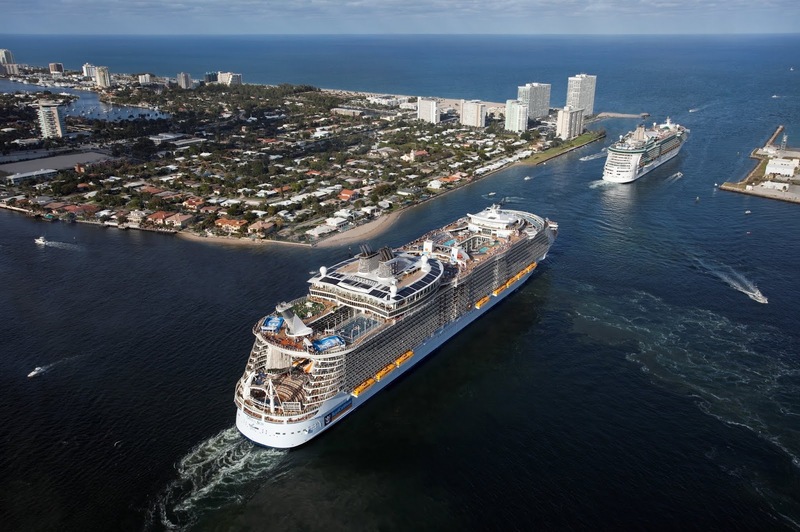 However, before arriving in the sunshine state, Mariner will undergo a $90 million overhaul adding features that will make this ship a “must” for anyone looking for a quick getaway! Disney Cruise Line has announced that they will be bringing back the popular Star Wars Day at Sea and Marvel Day at Sea on two different cruise ships in 2019. Marvel Day at Sea will be offered on 10 Disney Magic cruises from Miami, Florida. 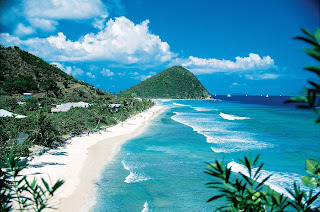 Departing January 6 and January 20, 2019, the Western Caribbean itinerary includes George Town, Grand Cayman, and Disney’s private island in the Bahamas, Castaway Cay. 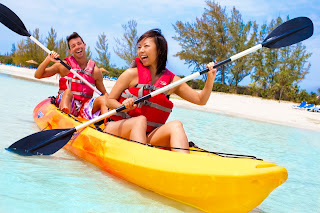 Departing January 11, January 25, February 8, February 22, and March 8, 2019, the Bahamas itinerary includes Key West, Nassau, and Castaway Cay. Departing February 3, February 17 and March 3, 2019, the Western Caribbean itinerary includes Cozumel, Mexico; and Castaway Cay. 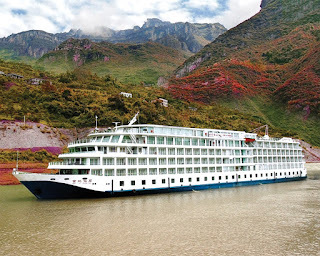 How About Cruising to South America? Many travel writers call South America the most exciting continent on the planet. It’s no wonder considering all that South America has to offer; cosmopolitan cities, rich cultures, gorgeous beaches and some of the world’s most amazing sights. The diversity of travel experiences is simply awe-inspiring and there’s no better way to sample it than by a land and sea cruise vacation! Extraordinary Sites: South America boasts over 100 UNESCO World Heritage Sites! Places such as Iguacu National Park in Brazil, the Galapagos Islands, Los Glaciares National Park in Argentina, and Machu Picchu in Peru and the dramatic Chilean fjords are on many people’s bucket list. In Brazil, no sight is more famous than the statue of Christ the Redeemer atop Corcovado Mountain in Rio. A call at Buenos Aires gives access to the impressive Iguazu Falls, one of nature’s most impressive monuments. And there’s so much more! So much of the east coast spent last Thursday sipping hot chocolate while watching Mother Nature cast her fury down upon us in the form of snow, wind and arctic temperatures, right outside their window. And if you’re like me, you are looking past all that snow, absorbed in a daydream of balmy temps, palm trees, and powdery white sand between your toes! It’s definitely time to hop on a cruise ship to someplace where the dress code is no more than shorts, tees and flip flops! A Caribbean cruise is an obvious choice. The islands hit by this fall’s hurricanes are once again ready to welcome visitors and many cruises leave from a port near you, eliminating the hassle of a flight. Royal Caribbean’s Anthem of the Seas offers some great itineraries right out of Cape Liberty, New Jersey. It only takes two relaxing sea days in Anthem’s gorgeous enclosed solarium before you can begin island hopping around Puerto Rico, St. Maarten, Antigua, St. Lucia, Barbados and St Kitts. 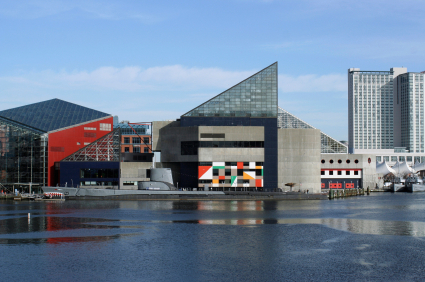 And no worries if it’s easier for you to drive to Baltimore. Royal Caribbean’s Grandeur of the Seas can also get you to those same summer wonderlands! Some years my New Year’s resolutions revolve around diet. I will lose ten pounds, I will eat more veggies, or I will cook healthy meal at home instead of picking up a pizza for dinner. Other years my resolutions are all about organization. I will clean out every closet, make photo books of my last ten cruises, or possibly tackle throwing out the stuff that’s boxed away in the basement. Results have always been on the “not so good” side. However, this year my New Year resolutions are all about travel and cruising! Pledges that will hopefully be a lot easier and more fun to keep! I will cruise to a new destination. And since my Cuba cruise is already booked for May, barring any emergency, that is a resolution I will keep. What about you? 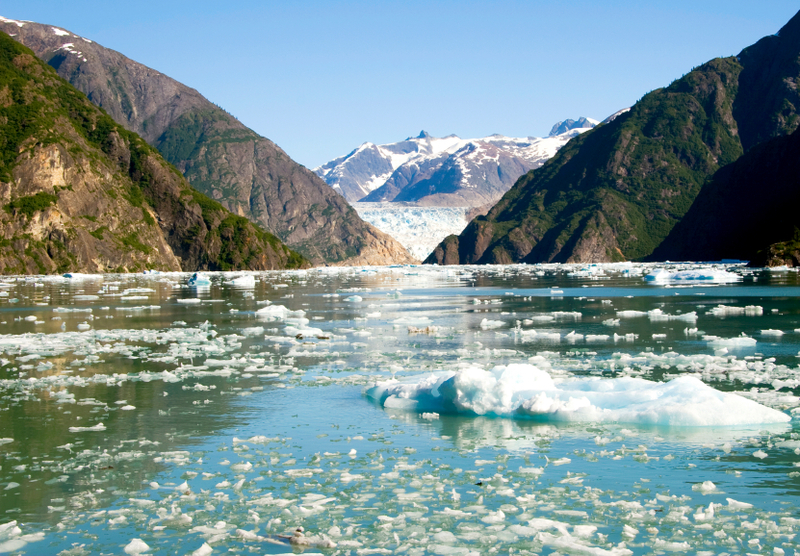 Have you cruised to Alaska, Northern Europe or the Mediterranean yet? What about South America, Hawaii or Asia? You can cruise to so many wonderful places! 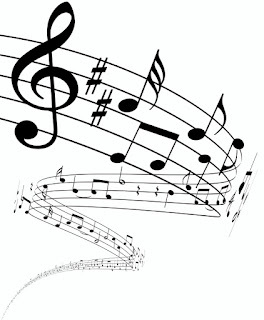 And while Bermuda and the Caribbean are always a good bet for a lovely time, aren’t you ready for something new?